A Summer of Science: The colorful side of research! Hey everybody – it’s Miguel again! 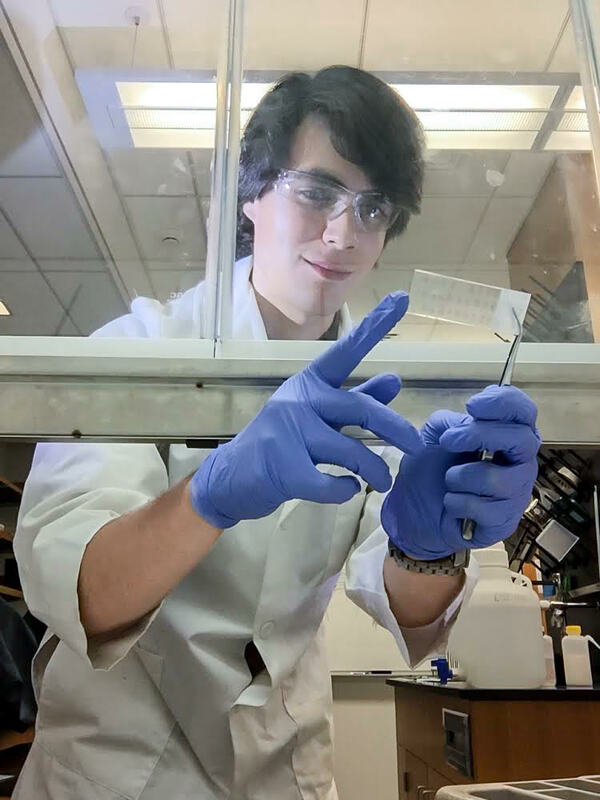 A few weeks ago, I told you about how we cut pieces of brain and muscle tissue into tiny pieces, and then put them on microscope slides (click here to read that post). The next step in my work is to stain those microscope slides so the tissues are visible to us. If you remember, each slice of tissue, which we call a section, is so thin that if you try to look at it under the microscope, it’s hard to see anything at all. The tissue looks almost invisible! To make tissues visible, we add color to the cells, in a process we call staining. Staining is a lot of fun! (It’s kind of like dying Easter eggs or cascarones.) To do this, you dip your microscope slides into a special chemical solution. Different chemicals stain different types of cells different colors. After dipping the slide into the chemical stain, you rinse it a few times to get the excess stain off, and finally, put a thin glass cover on it. Watching your tissue appear on the slide in little bursts of color is really cool. Some stains are especially bright and pretty! 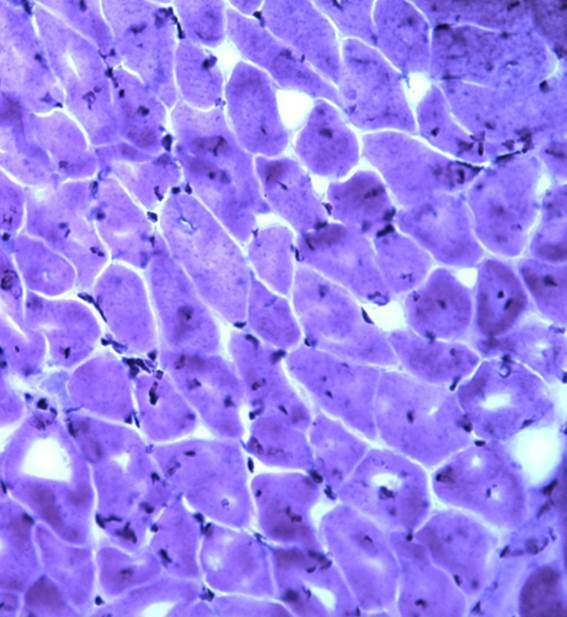 A muscle stained with H & E. The dark spots are muscle cell nuclei. short). This stain works because hematoxylin stains DNA dark purple, and eosin stains the rest of the cell bright pink. Because the DNA is in the nucleus of a cell, the nucleus is stained dark purple. We use another combination of stains to tell what type of cell a muscle cell is. 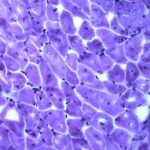 To learn if a muscle cell contracts fast or slow (in other words, if it is fast-twitch or slow-twitch), we stain for Myosin ATPase, an enzyme found in muscle cells. This stain causes individual cells to either look dark brown or light brown. Another enzyme, Succinate Dehydrogenase (or SDH) also occurs in muscle cells. Staining for SDH colors the muscle cells dark or light blue, and tells us how much oxygen is used as the cells get energy (or, their aerobic capacity). Muscle cells stained with Myosin ATPase (left) and SDH (right). The chemical I use to stain brain cells is called Thionin. Thionin stains the cell bodies of brain cells to a beautiful light blue color. A gecko brain stained with Thionin. 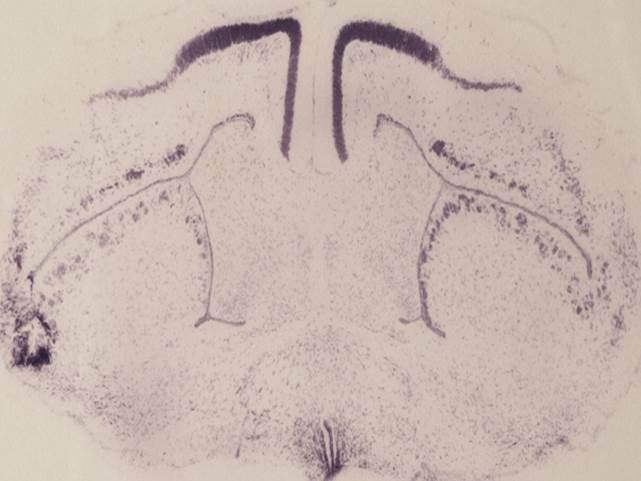 I am looking forward to spending some time at the microscope with my brain slides and appreciating the inner neural architecture that makes lizards who they are! Miguel is a college student, a scientist, a jazz musician, and a photographer!